Collectors with a penchant for paintings by regional artists will find Anne Irwin's Atlanta gallery to be the perfect place to discover works by some of the South's finest. Parking: Free parking is available at the gallery. MARTA: Take MARTA to Lindbergh Center Station. Out of the station walk north on Lindbergh Lane and turn right on Sidney Marcus Boulevard. 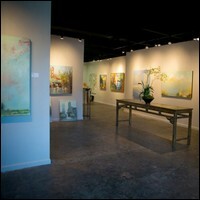 Turn left on Piedmont Road and right on Miami Circle to reach the gallery.